Home Entertainment What are Blackpink’s Stage Outfits and Fashion Styles? Although they just have debuted in 2016, BLACKPINK are already famous for their girl-crush concept, not only in their own country of South Korea but also worldwide. Besides their music, BLACKPINK are also well-known as a group whose fashion style is not to be underestimated, thanks to their solid stylist team who always know what they are doing with the four BLACKPINK ladies. The group is made up of the versatile Jennie, the 4D and top-tier visual Jisoo, dancing queen and youngest member Lisa, and the powerhouse vocalist Rose. Thus, in this article Channel-Korea will explain all about BLACKPINK’s fashion, starting with a general view of BLACKPINK’s stage fashion, consisting of each of BLACKPINK’s member stage outfits; a general view of BLACKPINK’s fashion style; the fashion styles of Jennie, Jisoo, Lisa, and Rose; and the fashion ranking of BLACKPINK’s members. So, keep reading! Just like their senior labelmates BIGBANG and 2NE1, BLACKPINK also often, almost always in fact, dress in a luxury wardrobe, not only when they go to award ceremonies but also when they perform on regular music shows. Well, aren’t you curious about what BLACKPINK members wear? Here we have compiled a list of each member of BLACKPINK’s stage outfits that you must know about! 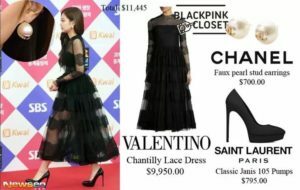 In the first picture, Jennie is seen wearing a see-through black dress from a Valentino collection, named Chantilly Lace Dress; pearl earrings from Chanel, named Faux Pearl Stud Earrings; and black high heels from Saint Laurent Paris, named Classic Janis 105 Pumps. You can get all the items that Jennie wore in this picture for KRW 12,181,982 or $11,445. 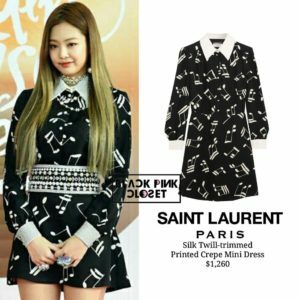 In the second picture, Jennie is wearing a black dress with a music note pattern, which it turns out is from a Saint Laurent Paris collection, named Silk Twill-trimmed Printed Crepe Mini Dress. You can get Jennie’s outfit in this picture for KRW 1,341,142 or $1,260. 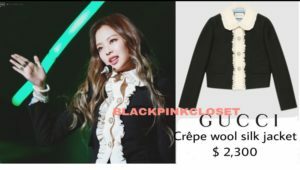 In the third picture, we can see how Jennie first earned her nickname as the ‘Human Gucci’, based on her appearance at one BLACKPINK performance as she wears a black and white suit which comes from Gucci, named Crepe Wool Silk Jacket. You can get Jennie’s outfit in this picture for KRW 2,448,098 or $2,300. In the fourth picture, Jennie looks stunning with a high ponytail hairstyle while wearing a black glittery dress, which comes from a Balmain collection, named Structured Fitted Dress. You can get the gorgeous Jennie’s outfit in this picture for KRW 2,364,011 or $2,221. 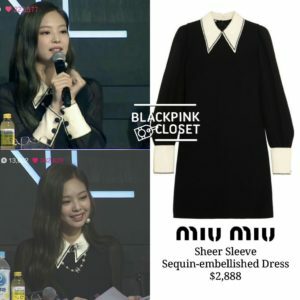 In the fifth picture, Jennie looks elegant as she wears a black dress with the see-through sleeves from the brand Miu Miu, named Sheer Sleeve Sequin-embellished Dress. You can get Jennie’s simple yet sweet dress in this picture for KRW 3,073,960 or $2,888. 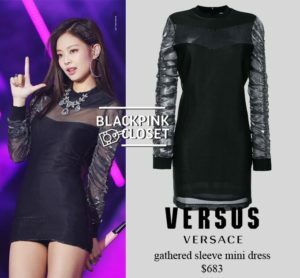 In the sixth picture, Jennie performed in another black dress with a see-through top which comes from Versace, named Gathered Sleeve Mini Dress. 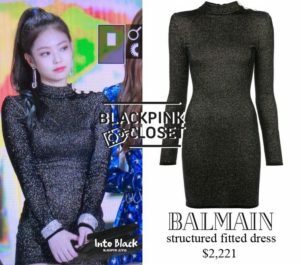 You can get Jennie’s dress in this picture, which is considered the most low-priced for a high-end brand, for KRW 726,978 or $683. 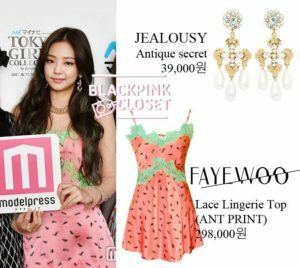 In the seventh picture, Jennie looks cheerful in a strawberry-patterned mini dress, which comes from the Korean high-end brand Fayewoo, named Lace Lingerie Top. In addition, Jennie also wears gold and pearl earrings, which come from the brand Jealousy, named Antique Secret. You can get Jennie’s two items in this picture for KRW 337,000 or $316.61. 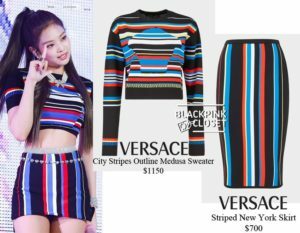 In the eighth picture, Jennie looks sporty with a colorful crop top and mini skirt, which come from the high-end brand Versace, named Cuty Stripes Outline Medusa Sweater and Striped New York Skirt. You can get the wonderful outfit pair in this picture for KRW 1,969,122 or $1,850. 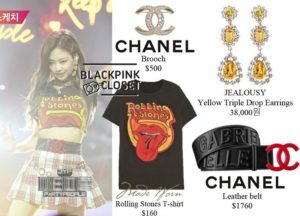 In the ninth picture, Jennie is performing at SBS Park Jin Young Party People with rocking outfits and accessories which come from the brand I Made You, named Rolling Stones T-shirt, Chanel Brooch, Jealousy Yellow Triple Drop Earrings, and a Chanel Leather Belt around her waist. You can get this set from Jennie’s wardrobe for KRW 2,605,628 or $2,448. 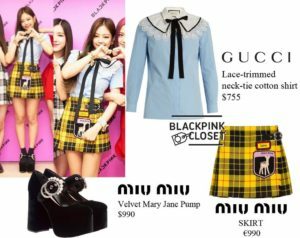 Finally, in the last picture, Jennie has turned up to the press conference for BLACKPINK’s first Japan Showcase while wearing a baby blue blouse, from the brand Gucci, named Lace-trimmed Neck-tie Cotton Shirt; a yellow and black checkered skirt, which comes from the brand Miu Miu; and black platform high heels from the brand Miu Miu, named Velvet Mary Jane Pump. You can get all the items in this picture for KRW 1,858,426 or $1,746.